Republican Party 2016 primaries. This table, Republican Party Table 1, compares candidate Trump’s results with the combined results of the competing candidates applying the standard margin of error calculations. Presentation of exit poll results are often criticized because the standard MOE formula does not address all the other possible errors common to all surveys. 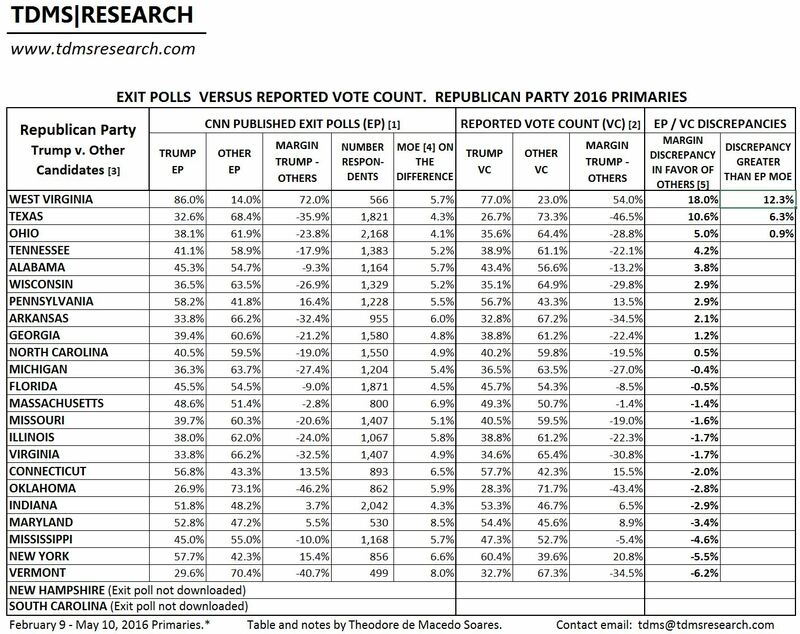 The accompanying table, Republican Party Table 2, addresses this criticism by taking into account the total survey error (TSE) calculated by comparing 106 exit poll results for the main candidates in the Republican Party primaries with the official vote counts. Exit polls (EP) conducted by Edison Research and published by CNN shortly after the closing of polls for the state and downloaded by TdMS. Copies are available. Exit poll results are derived from the gender category–the proportion of men and women voting for each candidate. As these first published exit polls were altered/adjusted to conform to the unverified computer vote counts, the discrepancies noted above were adjusted to near zero in the final EPs. This table compares candidate Trump’s results with the combined results of the competing candidates. In contrast to the Democratic Party primaries results, where 22 of 25 EP/VC discrepancies favored Clinton the discrepancies in the Republican Party primaries were more balanced–for and against Trump–which is the expected result of an impartial vote count and random errors in the exit poll. Two states, West Virginia and Texas exhibited very large discrepancies, far exceeding the MOE of the exit polls. In West Virginia Trump’s vote count at 9% less than predicted by the exit poll plus a 5.3% increase in the vote totals of minor candidates plus a 2.7% increase in the vote totals for Kasich compared to the exit poll predictions formed the bulk of the large 18% discrepancy. In Texas, Cruz’s home state, Trump’s vote count at 5.8% less than predicted by the exit polls plus Cruz’s 4.7% increase in the vote count than predicted by the exit polls comprised the bulk of the discrepancies. 1 Comment on "Republican Party Table 1. 2016 Primaries"
Donald Trump Warned Of A ‘Rigged’ Election . . . Was He Right?